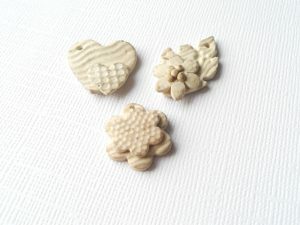 Using this fascinating material you will learn a range of techniques that will enable you to make a pair of earrings and a pendant/ bracelet charm in a relaxed and friendly atmosphere. 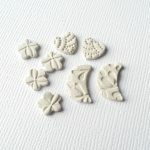 You will be taught about the material qualities, how it can be cut, formed, smoothed, textured, dried, fired and finished. You will also be able to add small stones and patination liquid to your designs to create further effects. As a warm up task you will plan your designs and prototype them using Plasticine which will give you a good understanding of what you can achieve and how your product would look. Then you will have lots of time to create your masterpieces with plenty of help if needed. The course will start at 10am with coffee, health & safety information and a general introduction. Following this I will show you the various techniques and you can get on with prototyping your designs. Tea and coffee, along with biscuits, are provided throughout the session and as the day progresses you will complete your projects. 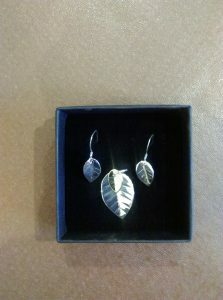 By 2pm you will have 2 pieces of jewellery to be proud of. or for further information please get in touch: contact@thebusyboxroom.co.uk or simply use the contact form on the website. 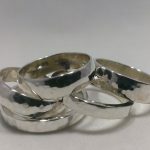 This 2 1/2 hour short course will deliver all of the necessary knowledge to help you make your own sterling silver ring. 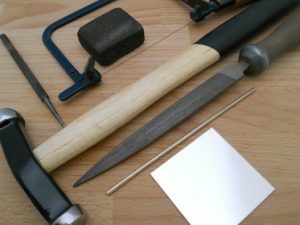 You will follow a series of demonstrations to show you how to mark and cut your silver to the correct size. 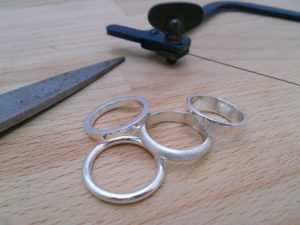 After that you will learn how to shape, solder and clean up your ring to make it smooth. Finally you will be shown 2 methods of applying a texture to your ring before polishing and reaching the impressive end product. There will be a short, natural break whilst the rings are being cleaned and at this point light refreshments will be provided. 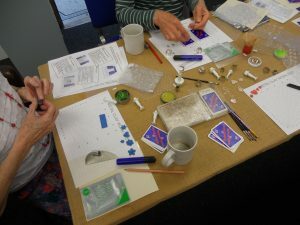 This course will allow you to experience a range of basic jewellery making techniques in a relaxed & friendly atmosphere. 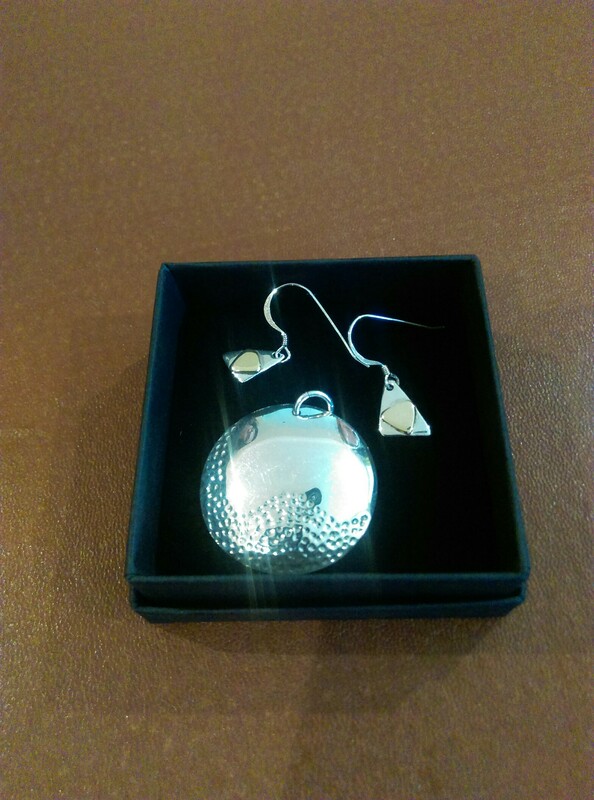 It will include marking out, cutting, filing, smoothing and polishing your silver. 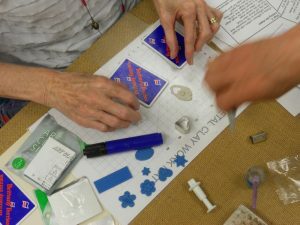 You will also be shown how to use different pieces of workshop equipment to add textures to your designs helping you to create that one off masterpiece. 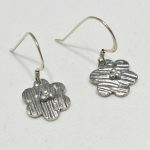 Get to grips with simple hand tools by making a pair of earrings using cutting and texturing techniques. 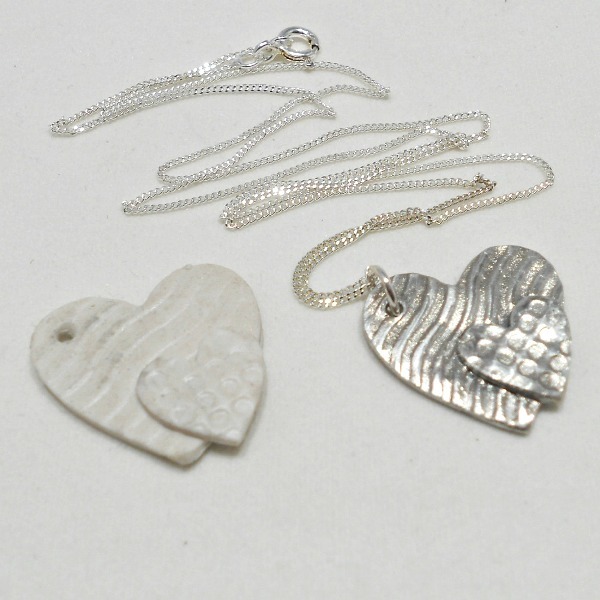 Then design and create a pendant by marking out, cutting and filing. 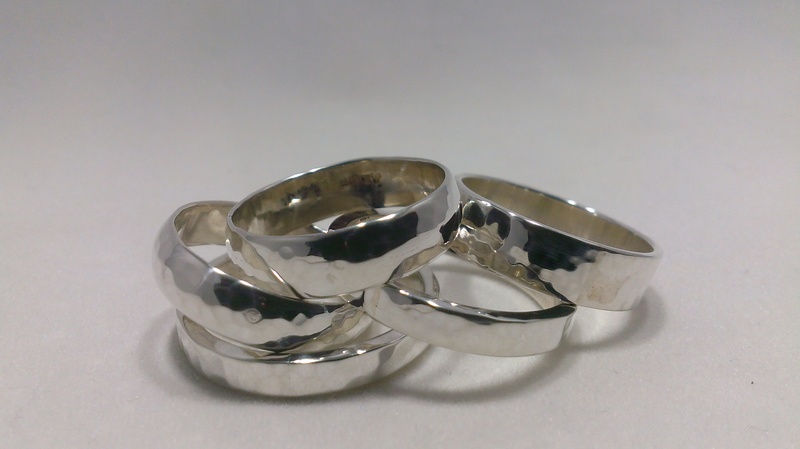 Finally, as your confidence grows you will manufacture a beautiful finger ring in the perfect size. The course will start at 10am with coffee, health & safety information and a general introduction to me and my workshop. 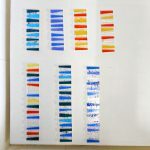 Following this I will show you the various techniques to complete your first exciting piece. You will need to provide your own lunch, however tea, coffee and biscuits will be available throughout the session. By 3pm you will have three pieces of jewellery to be proud of. On this course you will spend the day creating 4 wonderful products to be proud of. We will begin at 10am with a brief introduction to health and safety and this will be followed by your first task. 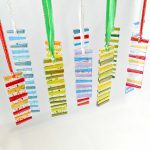 I will concentrate on teaching you how to cut glass effectively, clean it and apply extra features to make a sun catcher. 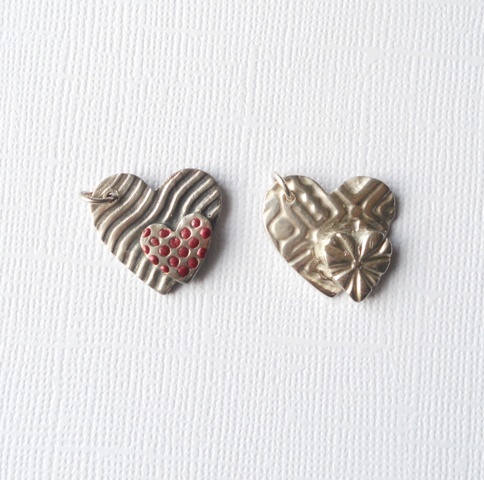 Task two will be something a little smaller and more delicate – jewellery. You can practice your cutting and joining skills in this task by designing and creating either a pendant, brooch or pair of earrings. You will also be given the chance to use dichroic glass which will give some beautiful effects to wow your friends. After a short break we will move onto our 3rd piece – a coaster/ tile. Although a straightforward shape, I will demonstrate how you can add copper or mica inclusions into your piece to make them extra special. 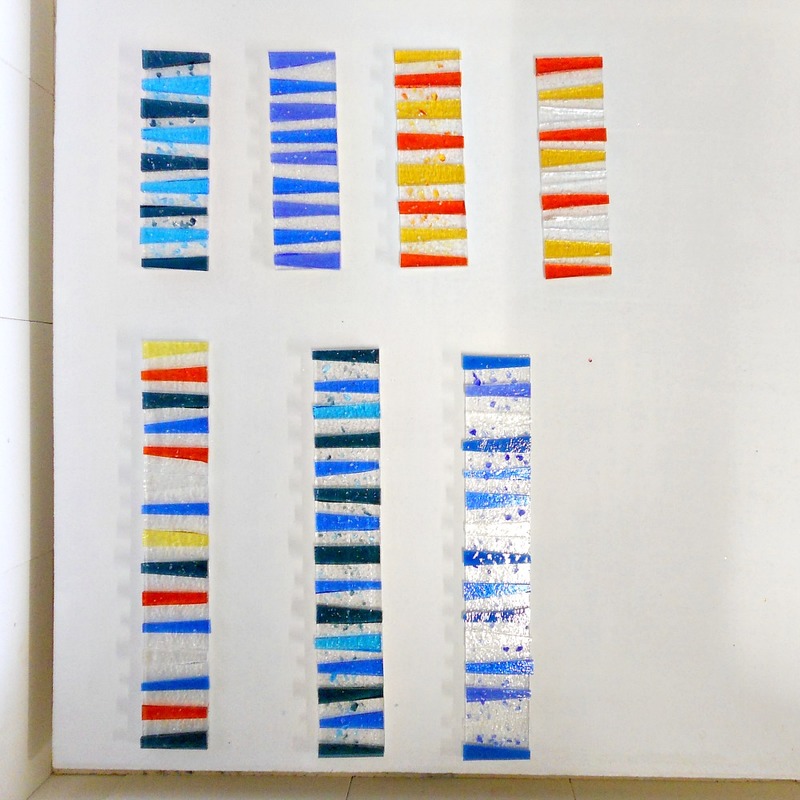 Finally, you will make your last and largest piece of the day. You will have a choice of product which can be discussed at the time based on your earlier experiences and what you feel comfortable doing. 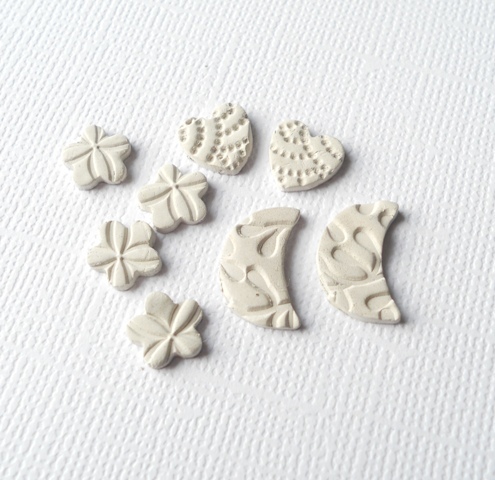 The course will end at 3pm – please note you will not be able to take your products away with you on the day as they will need to go into the kiln for several hours. Products can be collected one week later or can be sent by post at an extra cost. On this course you will spend the session creating an unusual one-off product to be proud of. We will begin with an overview of glass fusing health and safety and an introduction to the tools, equipment and processes. 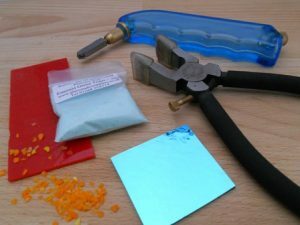 You will be taught how to cut glass and layer it with other components such as powders, frits and inclusions to achieve your end design. Please note you will not be able to take your products away with you on the day as they will need to go into the kiln for several hours. Products can be collected approximately one week later or they can be delivered by post at an extra cost. 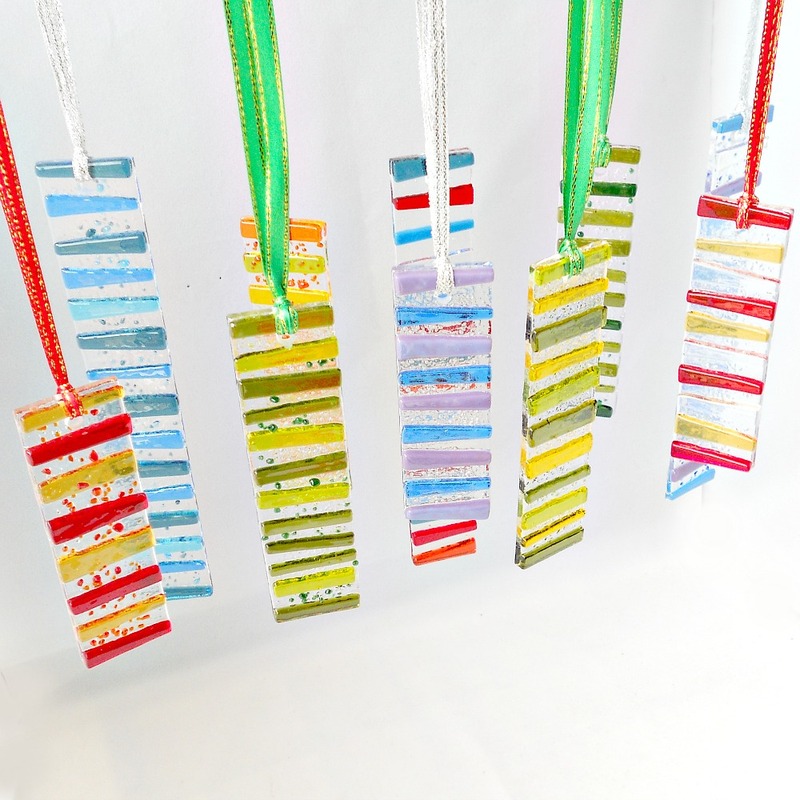 If you have taken part in one of my beginner’s courses then this is naturally the next step. 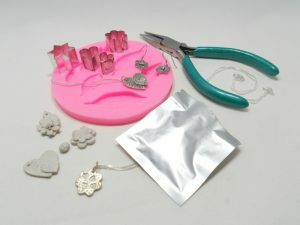 Here you will experience a range of more advanced jewellery making techniques in a relaxed & friendly atmosphere. I will teach you how to make a bezel and set a cabochon stone into a pendant creating a beautiful end product to be proud of. 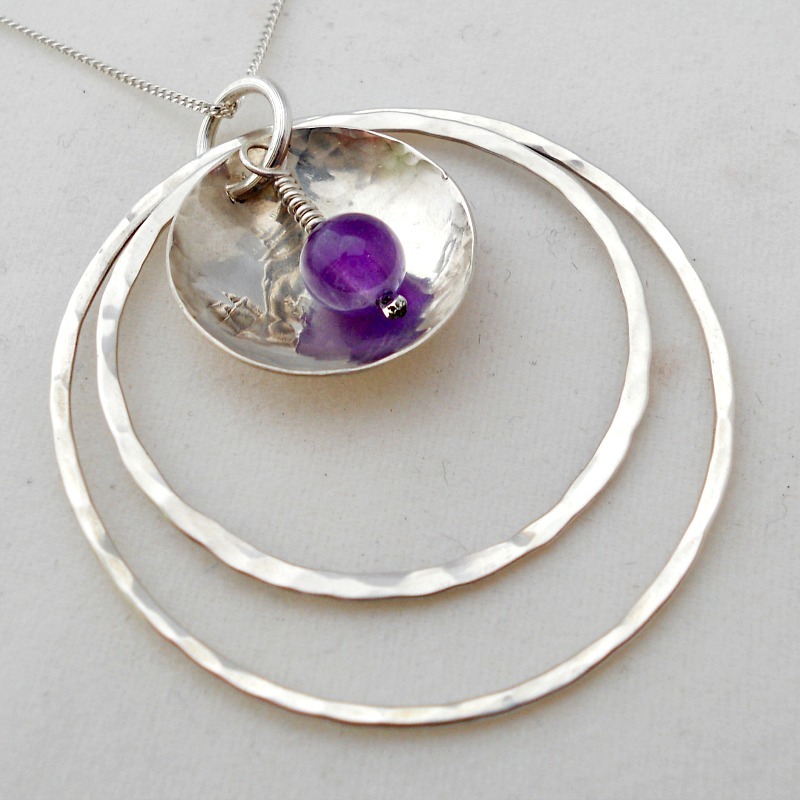 You can personalise your pendant shape further by piercing out your own design and adding textures that you learnt about on the beginner’s course. Later, I will demonstrate how to create a stunning ‘fiddle’ ring to impress all of your friends. The course will start at 10am with coffee, health & safety information and a general recap of the workshop facilities. Your warm up task will be to create a design for your pendant and decide what shape and textures it will have. 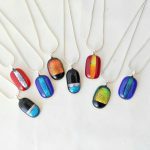 Following this I will show you the various techniques to complete your bezel setting. Later on we will work through the manufacture of the ‘fiddle’ ring where previous knowledge from the beginners course would be an advantage. A light lunch will be provided with tea and coffee available at regular intervals and as the day progresses you will complete your projects. 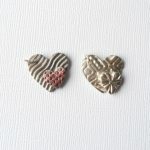 By 3pm you will have 2 quality pieces of jewellery to be proud of. For further information please get in touch: contact@thebusyboxroom.co.uk or simply use the contact form on the website.